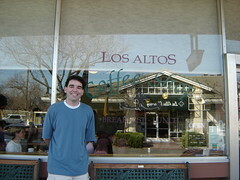 Jason works so hard for our customers, he had to get a caffeine IV inserted into his vein at the Los Altos Coffee Shop. The Starbucks baristas know its time to change shifts when Jason shows up for his afternoon coffee. Peet's down the street named a new beverage "the Jason" -- four shots of espresso, and a sprinkle of nutmeg.